8/30/2016–GOLDSBORO, NC–It was a beautiful, clear, sunny morning as five teams from around the state began checking in to the Cadet Competition being held at Seymour Johnson Air Force Base. Teams were met by the cadet staff, working under the direction of Maj Michael Willis, NC Wing Cadet Competition Activity Director, and C/2d Lt Tyler Bogart, Cadet Commander of the event. It soon became apparent that this was not a time for socializing, as teams were each assigned a room and told to immediately change into their blues uniforms and assemble for the activity briefing. Often thought of as Color Guard Competition, the Cadet Competition is actually about being a well-rounded cadet and most importantly, the ability of individuals to put aside their own desires and come together as a team for the good of the group. Each team of six cadets was accompanied by two senior member escorts, whose primary duty was to ensure that the team was in the right place at the right time, with the right equipment and in the right uniform, which was no small feat in itself! Teams competed in both an indoor practical and an outdoor practical, where they were given a scenario for posting and retrieving the colors indoors, and raising the flag to half-mast, then lowering and folding it outdoors. In both instances, teams were given 5 minutes to create a plan and then execute that plan. In addition to color guard duties, there were several other components of the competition. 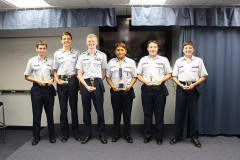 Cadets were given 70 minutes to complete a 70 question multiple choice test consisting of questions from Learn to Lead volumes 1 and 2, and the first six aerospace modules. In the category of public speaking, each team selected an individual to represent their team by giving an impromptu speech. The chosen cadets were given ten minutes to plan how they would explain to Maj Gen Vazquez how their squadron celebrates National Aviation Day, then deliver a 2-3 minute speech. Both of these events had individual winners, but also counted toward the overall team score. During the Team Leadership Problem, teams were given a bag of 13 cut up playing cards and asked to assemble them in numerical order, without speaking to each other. Cadets had to learn how to work together and communicate non-verbally to reach their goal quicker than the other teams. The uniform event was based on a combined score for the Spot Inspection where two cadets from each team were randomly selected and scored on their abilities in wearing their uniforms properly, and the Uniform Preparation, consisting of two cadets putting a blues uniform together based on a given scenario. Also represented were Goldsboro Composite Squadron and Franklin County Composite Squadron. All in all, it was an outstanding day for all involved. If your squadron was not part of this competition, you have an opportunity coming up in the near future as the 2017 NC Wing Competition will be held this January and all squadrons are encouraged to participate.